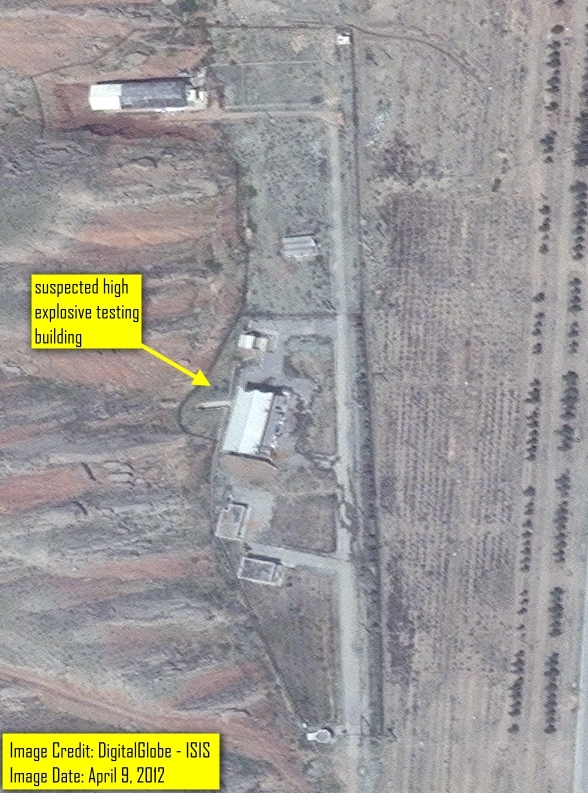 Recent satellite imagery from GeoEye obtained by ISIS shows what appears to be further sanitization activity at the site in the Parchin military complex where Iran is suspected to have conducted high explosive tests pertinent to the manufacturing of nuclear weapons. 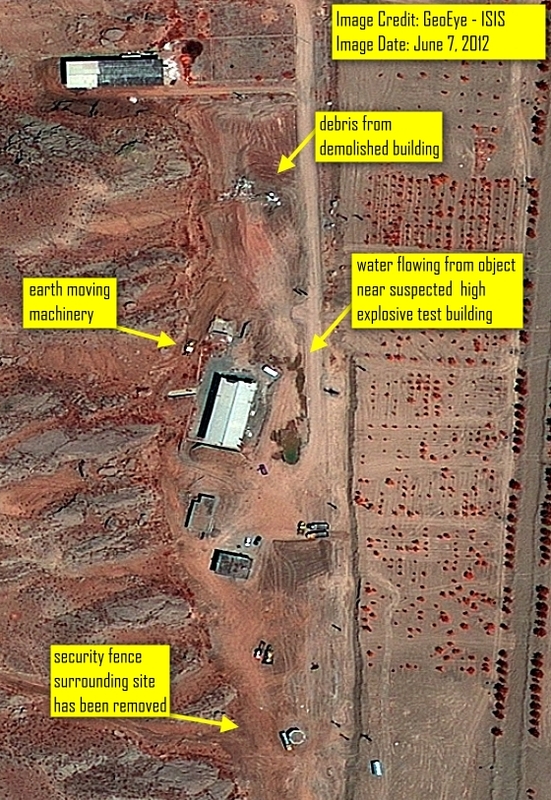 The latest satellite imagery from June 7, 2012 shows continued activity at the site where the International Atomic Energy Agency (IAEA) suspects Iran may have conducted high explosive compression related to the development of nuclear weapons. The image shows heavy machinery tracks and earth displacement throughout the site. The debris from one of the razed buildings visible in the imagery from May 25, 2012 has now been consolidated into piles just north of the site of the former building (figure 1). There is evidence of earth moving machinery and excavation activity near the second demolished building north of the building suspected to contain the high explosive testing chamber. On June 4, 2012, IAEA Director General Yukiya Amano said at a news conference in Vienna: “The satellite imagery indicates that these activities include the use of water, demolishing of buildings, removing fences and moving soil.” This recent imagery taken a few days after the statements shows the activities mentioned by the Director General and confirms that the IAEA should be concerned that Iran is attempting to cleanse the site prior to allowing an IAEA visit. Iran should immediately allow the IAEA access to Parchin and explain the significance of these apparent clean-up activities. 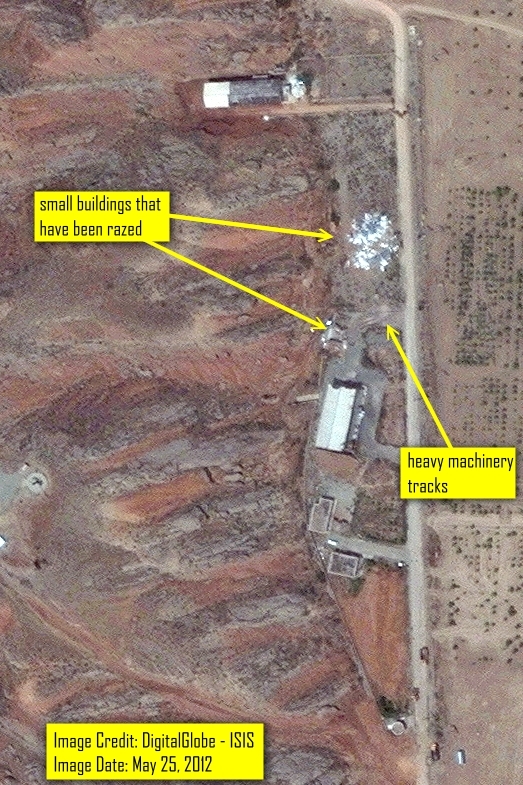 If Iran has nothing to hide, its activities at this site add a further layer of suspicion and negatively impact efforts to build confidence in the peaceful nature of Iran’s nuclear program, as well as make it less likely the IAEA can arrive at a conclusion about the alleged activities that took place at this site. Figure 1. Satellite imagery from June 7, 2012 showing considerable vehicle and earth moving activity near the building at the Parchin complex that the IAEA suspects was used in high explosive tests related to nuclear weapons development. Figure 2. Earlier imagery from May 25, 2012 showing demolished buildings near the suspected high explosive testing building. Figure 3. Earlier imagery from April 9, 2012 showing water flowing from the suspected high explosive test building. As seen in the June 7th imagery (figure 1), the areas where the water flowed in this image are altered due to earth displacements.